"Don't Wait for extraordinary opportunities. Seize normal moments and make them great"
The inspiration for this post comes from the Grade 8 Boys Basketball team that I'm currently coaching with Steve Cowan (@stvcwn) and Brandon Chancey. The boys came together for the first time back in the fall and over the course of the past four months have shown great desire, dedication, perseverance and resilience. Similar to any athletic season, there have been high points, low points, moments of triumph and moments of adversity. Through a lot of hard work, the boys have earned the opportunity to play in the Delta District Final on Thursday evening. Despite belonging to a relatively small district composed of seven secondary schools, the accomplishment of making it this far remains significant. Thursday's game also presents a tremendous opportunity for the team. The players have never been more motivated and engaged in games and practices. We have stressed to the boys the importance of performing to the best of their ability because there is no guarantee that they will have this opportunity in the future. Even though I don't particularly like the term, everyone knows what I'm referring to when I speak of 'teachable moments'. These moments usually arise spontaneously when a student asks an interesting question or makes an interesting comment and it takes the conversation on a tangent away from our initial plan. As teachers, we often wrestle with what to do in these situations. On one hand we want to continue along the tangent, capitalizing on our students' peaked interest. On the other hand, we hesitate to stray too far from our plan, feeling the pressure to cover the extensive prescribed curriculum. So, how should we handle these situations? I suggest that when these opportunities arise and our students are most engaged, we should follow the tangent and turn it into a great moment of learning. If our students' curiosity is peaked, why would we do anything to squash it? This is when the most relevant and deepest learning is likely to occur. Rather than kill our students' interest in a topic by cutting short a discussion and forcing ourselves back to the prescribed curriculum, we should be looking to tie our discussions back to important aspects of the curriculum. I'm not advocating that we ignore the prescribed curriculum, nor am I suggesting that a set curriculum need not exist. However, I am suggesting that we consciously choose to teach less, allow for and seize the spontaneous opportunities to pursue the relevant, meaningful tangents that engage our students. 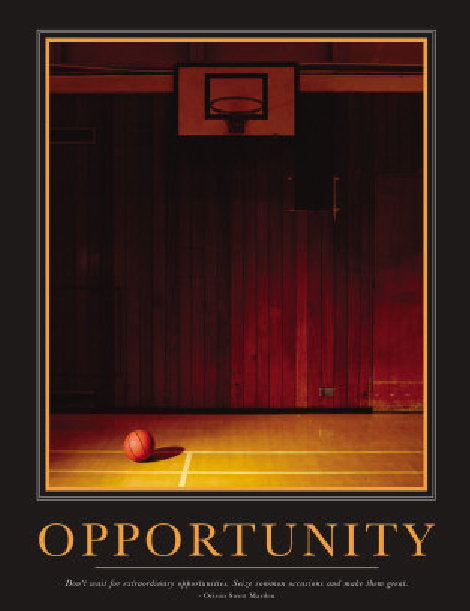 After all, similar to a basketball team's opportunity to participate in a district final, these meaningful opportunities in the classroom don't happen all the time. I encourage you to seize the moment! Often it boils down to the question, "What do you teach?" or in this case, "What do you coach?" A typical response might be Math, Social Studies, Music (or Basketball) ... but the great teachers know that what they really teach is ... students! Great teachers have an awareness of the moment and the opportunity. A former colleague at McMath, John Currie was known to be an outstanding Chemistry teacher. John's students knew their Chemistry but John was renowned for his ability to teach about life. The year John retired many of his former students paid tribute and attended his "final" class, which had very little to do with Chemistry and everything to do with teachable moments. What you describe is really the art of teaching. The ability to design or select learning experiences to fit the situation, the circumstances, and the needs of the student(s). Curriculum coverage with little regard for the learner is at best ineffective but sadly, far too common. Given the choice I'd always look for teachers that see themselves as teachers of students rather than teachers of a particular subject. Good luck in the playoffs, Aaron! Equally important as taking advantage of the opportunity is recognizing the opportunity. The 'learning moments' for students are constantly presenting themselves. It is up to us to recognize when these moments are for each individual. I agree, we are here to teach students. The course and the content is simply one of te vehicles to do this through. Often the moments of learning occur outside of the classroom, in the hallway, in the office, in the gym etc when students are learning about life and about themselves.